Son of (1) Francesco I Sforza and (3) Bianca Maria Sforza. 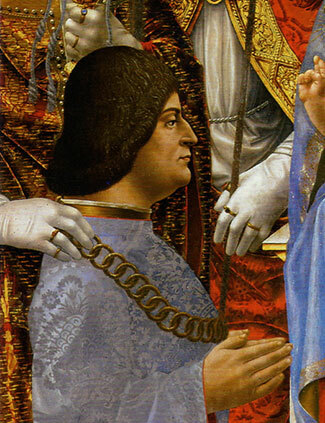 In 1480, several years after the death of his brother (4) Galeazzo Maria Sforza in 1476, he succeeded in gaining control of the regency but did not become duke in name until his nephew Gian Galeazzo Sforza died in 1494. His commissions, both public and private, were divided between Lombard and Tuscan masters. Milanese architects were responsible for many of his most important projects, including the construction of the Lazzaretto (1488–1513) and S Maria presso S Celso (begun 1491 by Giovanni Giacomo Dolcebuono) in Milan, and a farm complex, known as the Sforzesca, outside Vigevano. Several prominent Lombard sculptors, in particular Giovanni Antonio Amadeo, were commissioned to work on the façade of the Certosa di Pavia. Of the artists Ludovico encouraged to come to Lombardy, an undated letter reveals that he was considering Botticelli, Filippino Lippi, Perugino and Ghirlandaio as court artists. About 1482 Leonardo da Vinci arrived in Milan, where he remained as an intimate member of Ludovico’s household for 18 years. As court painter, Leonardo is documented as having portrayed two of Ludovico’s mistresses, Lucrezia Crivelli and Cecilia Gallerani. The latter may be identified with the painting Portrait of a Lady with an Ermine (c. 1490–91; Kraków, Czartoryski Col.). Much of his work was for such courtly ephemera as the designs for the spectacle Festa del Paradiso, composed in 1490. Another commission of which nothing survives was for a bronze equestrian statue honouring Ludovico’s father, which Leonardo worked on in the 1490s. A surviving work by Leonardo for the Duke is the Sala delle Asse (1498) in the Castello Sforzesco, Milan, where motifs of golden knots are interspersed among vegetation and heraldic shields. Other Tuscans at work in Milan during the 1490s included Donato Bramante. As a painter, Bramante produced an allegorical figure of Argus (1490–93) in the Castello Sforzesco (in situ). The development of the piazza, tower and castle at Vigebano in the 1490s, one of the most important campaigns of urban planning in the Renaissance, was the work of Bramante, working perhaps with Leonardo, under Ludovico’s supervision. Ludovico also took day-to-day responsiblity for projects financed by his brother (6) Cardinal Ascanio Maria Sforza, for example Bramante’s work on the new cathedral in Pavia and the monastic quarters (commissioned 1497) at S Ambrogio, Milan. The illuminator Giovanni Pietro Birago was also active in Ludovico’s court, producing, among others, several copies (e.g. London, BL. Grenville MS. 7251) of Giovanni Simonetta’s life of Francesco Sforza I, the Sforziada. Ludovico’s plans were destroyed by the invasion of Louis XII, King of France, in August 1499. Ludovico escaped, to return in February 1500, but following his final defeat and capture in April that year, he was confined to a prison in France for the remainder of his life. Image: Public Domain via Wikimedia Commons.